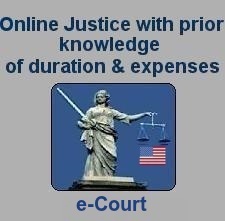 For your info, e-Court.us Legal Services LLC, a Delaware US company and e-Court.ca Legal Services International Inc., a Canada Incorporated company are the "administrative" Internet shells for civil and other disputes (such as labor) between businesses and/or individuals through a real Internet arbitration court. Amongst our sponsors we include not just managing professionals in notable law firms as Heenan Blaikie, McCarthy Tetrault, Miller Thomson, McLeod & Company, Cassels Brock & Blackwell, but also professionals in the small & boutique law firms. When you have a minute we kindly request your attention for https://e-court.us and consider to team up & seize the opportunity to profile you and/or your firm as Internet savvy and socially involved. We would be pleased to expand if you wish additional information. e-Court.us Legal Services International LLC.